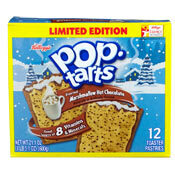 This year, Kellogg's has given us another new holiday-themed, limited edition Pop-Tart. It's full name is Frosted Marshmallow Hot Chocolate Pop-Tarts. Here's some advice I've never given about breakfast product... over-cook these Pop-Tarts. When the pastry is slightly over-toasted, these Pop-Tarts take on a new characteristic. You start to get the flavor of toasted marshmallow. 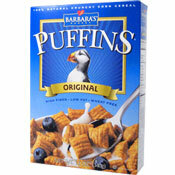 It's still a far cry from Hot Chocolate with Marshmallows, but it is interesting and more or less enjoyable. For the best holiday-themed Pop-Tart, go for Kellogg's Pumpkin Pie Pop-Tarts. Nutritional Considerations: Each single pastry serving of Marshmallow Hot Chocolate Pop-Tarts has 190 calories, 4 grams total fat (1.5 saturated and 0 trans), 36 grams total carbs, less than 1 gram dietary fiber, 19 grams sugar and 2 grams protein. 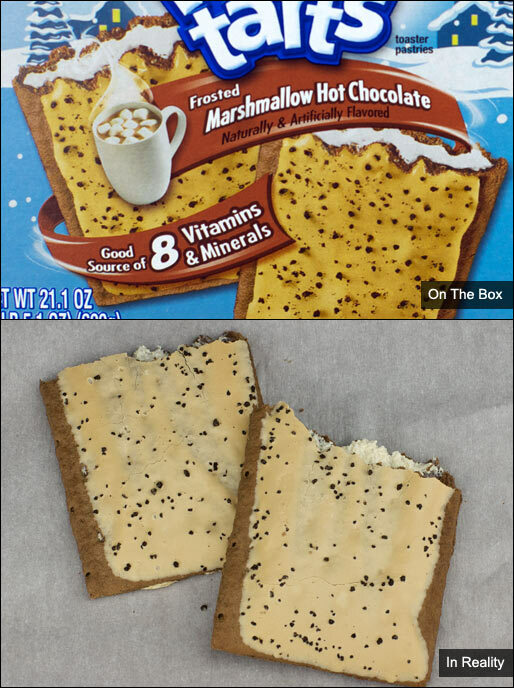 What do you think of Marshmallow Hot Chocolate Pop-Tarts?